With our premium membership, you can have more than one planbook at a time during a school year. You can click "Planbooks" at any time to be brought to a list of your planbooks. 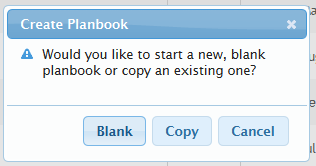 To add a planbook, click on the "Create Planbook" button and you'll be given a choice of starting a new blank planbook or copying an existing one. When managing multiple planbooks, it's important to give them names that you can easily recognize (Mrs. H Grade 4 2015-2016). See the article Copy Your Planbook for more information on copying existing plans. 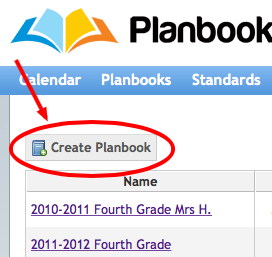 You can view a planbook by clicking on the planbook's name. Also, you can click "Edit" to change the set up of the planbook. 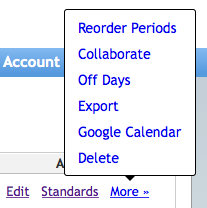 Clicking "Standards" will allow you to add, view, or modify the existing standards. Selecting "More", will give you a drop down menu with more advanced options.